Here at Helium Balloon we believe in making your life easy! So we've put together packages of some of our most popular combinations of products, all at a discounted rate than if you bought the items individually. These do-it-yourself kits are quite simply the easiest way to source everything you need for your event or promotion. Whether you need to decorate your home or event venue with an impressive display of balloons, want to arrange a 500 balloon release or a printed balloon promotional giveaway, we have tried to offer a package that will be suitable. They offer convenience and most importantly save you time and money &dash; a double bonus! If you can't quite find what you're looking for, get in touch and we may be able to put together a package to meet your individual needs. 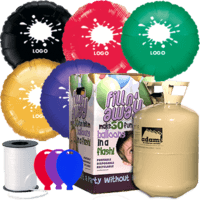 Decorate your party or event with this handy latex balloon party pack. The latex balloons and ribbon come in a whole range of colours for you to choose from. The helium cylinder is so easy to use you'll have your venue decorated in minutes! Latex balloons will float for approximately 8-10 hours so we advise you inflate your balloons just before your event starts. Once your order has been placed, we will contact you to confirm the balloon & ribbon colours you require. The perfect way to give any party or celebration that extra sparkle. The shiny foil balloons come in a whole range of colours & three different shapes for you to choose from. The helium cylinder is so easy to use you'll have your venue decorated in minutes! Foil balloons are self sealing and will float for at least 3-4 days, perfect to hand out to party guests to take home afterwards. Once your order has been placed, we will contact you to confirm the balloon & ribbon colours you require. 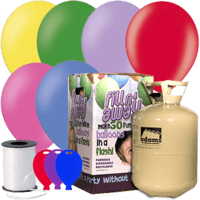 Add that extra touch to any birthday party with this birthday age latex balloon pack. You can choose from a wide range of age balloon designs in a range of different colours. 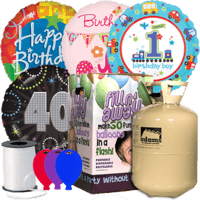 The helium cylinder is quick and easy to use making this a perfect decorating solution for any birthday celebration. Latex balloons will float for approximately 8-10 hours so we advise you inflate your balloons just before your event starts. Once your order has been placed, we will contact you to confirm the balloon & ribbon colours/age you require. Perfect for any event, this Small Printed Foil Balloon Pack includes your logo/design printed on to 25 x 18" foil balloons in one ink colour. 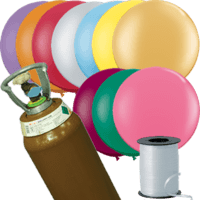 The balloons, ribbon & weights are available in a whole range of colours to choose from and the whole package is delivered in 7-10 working days. Foil balloons are self sealing and will float for at least 3-4 days. Once your order has been placed, we will contact you to confirm the balloon & ribbon colours and printing details you require. Perfect for any event or party, this Small Printed Latex Balloon Pack includes your design/logo printed on to 40x 10" latex balloons in one ink colour. The weights & ribbon are available in a whole range of colours and the whole package is delivered in 5-7 working days. Latex balloons will float for approximately 8-10 hours so we advise you inflate these just before your event starts. Once your order has been placed, we will contact you to confirm the balloon & ribbon colours and printing details you require. Perfect for any event, this Printed Latex Pack includes your logo/design printed on to 200 x 10" latex balloons in one ink colour. The balloons & ribbon are available in a whole range of colours to choose from and the whole package is delivered 5-7 working days. Latex balloons will float for approximately 8-10 hours so we advise you inflate these just before your event starts. Once your order has been placed, we will contact you to confirm the balloon & ribbon colours and printing details you require. Perfect for any medium sized corporate event or party, this pack includes the printing of your logo or design onto 400x 10" latex balloons in one ink colour. The balloons are available in a whole range of colours to choose from. The balloons & accessories will be delivered directly to you. You can have your helium cylinder delivered or it can be collected from your local depot & includes up to 28 days hire. Latex balloons will float for approximately 8-10 hours so we advise you inflate these just before your event starts. Packs including printed balloons have a 5-7 day turnaround. Once your order has been placed, we will contact you to confirm the balloon & ribbon colours and printing details you require. If you really want to get your company or brand name noticed, this large latex printed balloon pack is the most cost effective way to create a big impact. 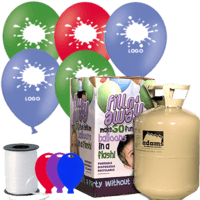 The pack includes the printing of your logo or design onto 1000x 10" latex balloons in one ink colour. The balloons are available in a whole range of colours to choose from and will be supplied with plenty of ribbon – perfect for giveaways & promotions. The helium cylinder can be delivered and collected to any UK business address or collected from your local depot and includes up to 28 days hire. Latex balloons will float for approximately 8-10 hours so we advise you inflate these just before or during your event. Packs including printed balloons have a 5-7 day turnaround. Once your order has been placed, we will contact you to confirm the balloon & ribbon colours and printing details you require. Please note that the cylinder in this package is large (150cm tall) and very heavy (76kg), so we would only recommend you collect this cylinder if you have a suitable transport / trolley. 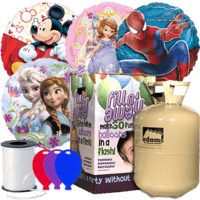 Decorate your party with this exciting TV & Film Character Foil Balloon Party Pack. Choose from a wide range of characters including Despicable Me, Spider Man, Winnie the Pooh, Fireman Sam, Minnie & Mickey Mouse, Frozen, Bob the Builder, all the Disney Princess's and many more! 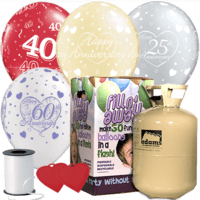 The helium cylinder is so easy to use, you'll have your venue decorated in minutes! Foil balloons are self sealing and will float for at least 3-4 days, perfect to hand out to party guests to take home afterwards. Once your order has been placed, we will contact you to confirm the character balloons you'd like, as well as the ribbon & weight colours you require. 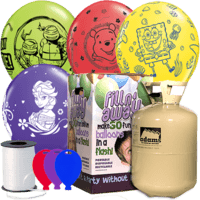 Brighten up your party with this exciting TV & Film Character Latex Balloon Party Pack. Choose from a wide range of characters including Spider Man, Teenage Mutant Ninja Turtles, Frozen, Sponge Bob, Doc McStuffins, Dora the Explora and much more! Latex balloons will float for approximately 6-8 hours so we advise you inflate your balloons just before your event starts. 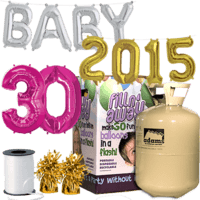 The helium cylinder is so easy to use, you'll have your venue decorated in minutes! Once your order has been placed, we will contact you to confirm the character balloons you'd like, as well as the ribbon & weight colours you require. 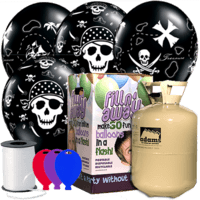 Make your party a day to remember with this Pirate Latex Balloon Party Pack. Includes 25 x 11" black latex balloons decorated with white pirate skulls and swords. Latex balloons will float for approximately 6-8 hours so we advise you inflate your balloons just before your event starts. 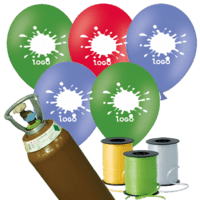 The helium cylinder is so easy to use, you'll have your venue decorated in minutes! Once your order has been placed, we will contact you to confirm the balloons you'd like, as well as the ribbon & weight colours you require. 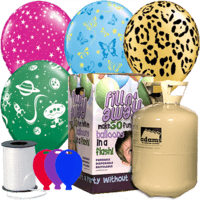 Go wild with this Animal Latex Balloon Party Pack! 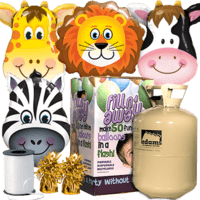 Choose from a selection of Animal latex balloons including Party Animals, Jungle Animals, Cuddly Pets, Fun Sea Creatures and more. Latex balloons will float for approximately 6-8 hours so we advise you inflate your balloons just before your event starts. 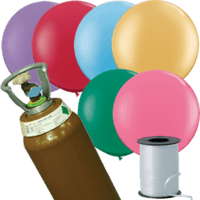 The helium cylinder is so easy to use, you'll have your venue decorated in minutes! Once your order has been placed, we will contact you to confirm the balloons you'd like, as well as the ribbon & weight colours you require. Amaze your friends with this fun Animal Giant Foil Balloon Party Pack. 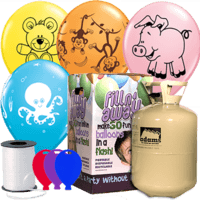 Choose from various giant balloon animals, including The Loveable Lion, Tickled Tiger, Jolly Giraffe, Mischievous Monkey, Zany Zebra, Funny Frog, Hilarious Horse & the Contented Cow. 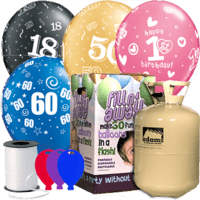 The helium cylinder is so easy to use, you'll have your venue decorated in minutes! Foil balloons are self sealing and will float for at least 3-4 days, perfect to hand out to party guests to take home afterwards. Once your order has been placed, we will contact you to confirm the animal balloons you'd like, as well as the ribbon & weight colours you require. Make your special day even more wonderful with these elegant foil balloons. We have a wide range of designs to choose from including Entwined Hearts, Butterflies, Roses and Just Married messages. Foil balloons are self sealing and will float for at least 3-4 days. 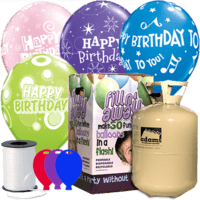 The helium cylinder is so easy to use, you'll have your venue decorated in minutes! Once your order has been placed, we will contact you to discuss the designs you'd like, as well as the ribbon & weight colours you require. Make your anniversary celebration even more special with these elegant foil balloons. 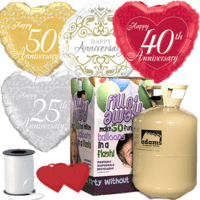 We have a wide range of designs to choose from including 25th, 40th & 50th Wedding Anniversary as well as Happy Anniversary designs. Foil balloons are self sealing and will float for at least 3-4 days. 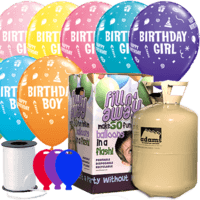 The helium cylinder is so easy to use, you'll have your venue decorated in minutes! Once your order has been placed, we will contact you to discuss the designs you'd like, as well as the ribbon & weight colours you require. Make your wedding venue look extra special with these elegant latex balloons. We have a wide range of designs to choose from and a range of colours including silver, gold, pearl white, ivory and diamond clear. Latex balloons will float for approximately 8-10 hours so we advise you inflate your balloons on the day. The helium cylinder is so easy to use, you'll have your venue decorated in minutes! Once your order has been placed, we will contact you to confirm the balloon designs you'd like, as well as the ribbon & weight colours you require. 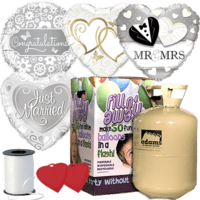 Celebrate that significant anniversary with these beautiful latex balloons. We have a wide range of designs to choose from including 25th, 40th, 50th & 60th Wedding Anniversary as well as Happy Anniversary designs. Latex balloons will float for approximately 8-10 hours so we advise you inflate your balloons just before the event starts. 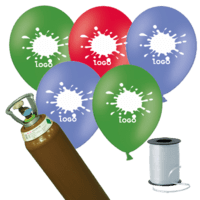 The helium cylinder is so easy to use, you'll have your venue decorated in minutes! Once your order has been placed, we will contact you to confirm the balloon designs you'd like, as well as the ribbon & weight colours you require. Brighten up your party with these decorative latex balloons. Choose from a whole range of themes including Stars, Spots, Safari Assorted Prints, Cupcakes & Presents, Frogs & Daisies, Palm Trees, Butterflies, Aliens, Casino Balloons and more! Latex balloons will float for approximately 8-10 hours so we advise you inflate your balloons just before the event starts. The helium cylinder is so easy to use, you'll have your venue decorated in minutes! Once your order has been placed, we will contact you to confirm the balloon designs you'd like, as well as the ribbon & weight colours you require. Celebrate in style with these birthday latex balloons. The Birthday Boy balloons come in an assorted pack of Dark Blue, Yellow, Orange, Light Blue & Lime Green and the Birthday Girl balloons come in an assorted pack of Yellow, Pink, Purple, Teal & Rose. Latex balloons will float for approximately 8-10 hours so we advise you inflate your balloons just before the event starts. The helium cylinder is so easy to use, you'll have your venue decorated in minutes! Once your order has been placed, we will contact you to confirm the balloon designs you'd like, as well as the ribbon & weight colours you require. 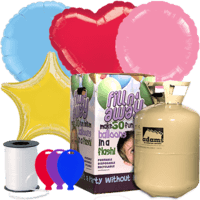 Make that birthday celebration extra special with this Birthday Latex Balloon Party Pack. We have a range of designs and colour assortments to choose from, with the Happy Birthday design decorated in Spots, Streamers, Musical Notes, Stars or Cakes! Latex balloons will float for approximately 8-10 hours so we advise you inflate your balloons just before the event starts. The helium cylinder is so easy to use, you'll have your venue decorated in minutes! Once your order has been placed, we will contact you to confirm the balloon designs you'd like, as well as the ribbon & weight colours you require. Perfect for any birthday party, this wide selection of foil balloons is guaranteed to make your day extra special. Choose from a huge selection of Happy Birthday Messages, Numbers, Designs and Colours to suit your theme. Foil balloons are self sealing and will float for at least 3-4 days. 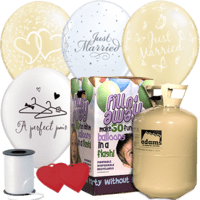 The helium cylinder is so easy to use, you'll have your venue decorated in minutes! Once your order has been placed, we will contact you to discuss the designs you'd like, as well as the ribbon & weight colours you require. Amaze your guests and decorate your event with these giant 3ft latex balloons, guaranteed to give any party the wow factor! You can choose from a huge variety of bright or neutral colours. The balloons & accessories will be delivered directly to you. You can have your helium cylinder delivered or it can be collected from your local depot & includes up to 28 days hire. Once your order has been placed, we will contact you to confirm the balloon, ribbon & weight colours you require. Amaze your guests and decorate your event with these giant 3ft latex balloons, guaranteed to give any party the wow factor! You can choose from a huge variety of bright or neutral colours. The balloons & accessories will be delivered directly to you. You can have your helium cylinder delivered or it can be collected from your local depot & includes up to 28 days hire. Once your order has been placed, we will contact you to confirm the balloon, ribbon & weight colours you require. Please note that the cylinder in this package is large (150cm tall) and very heavy (76kg), so we would only recommend you collect this cylinder if you have a suitable transport / trolley. Say I Love You in style with this Love Themed Pack. 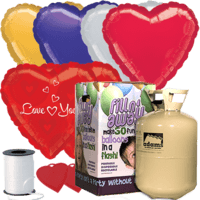 Choose from a variety of coloured foil heart shaped balloons including Red, Black, Pearl Ivory, Pink, Green, Blue, Yellow, Purple, Gold, Silver and Iridescent. Then choose two special I Love You foil balloons from a huge range of designs to complete your package. Foil balloons are self sealing and will float for at least 3-4 days. The helium cylinder is so easy to use, you'll have your venue decorated in minutes! Once your order has been placed, we will contact you to discuss the designs you'd like, as well as the ribbon & weight colours you require. Celebrate those milestone birthdays and special events with these giant number and letter balloons. They come in a choice of Silver, Gold, Black, Blue or Pink. A perfect way to add that extra sparkle to any party. You can choose from 0-9, A-Z, & and # balloons. Foil balloons are self sealing and will float for at least 3-4 days. Once your order has been placed, we will contact you to confirm the number/letter balloons you'd like, as well as the ribbon & weight colours you require.